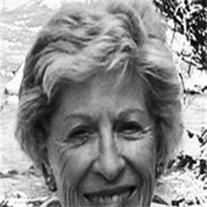 Merillat Jeanne Wellman, age 85, born June 7, 1925 in New York City, NY, died March 3, 2011 in Scottsdale, AZ. She is survived by her husband Emory; sons Christopher of Rockville, MD, Steven of Montgomery, TX, James (Jenny) of Gig Harbor, WA; sister Jacqueline Ellis of Belmont, AZ, four grandchildren, two great-grandchildren and marvelous nieces, nephews and cousins. After graduating from the University of Puget Sound she worked for Hill, Richards, an investment firm in Los Angeles until her marriage to Emory Wellman on December 3, 1949. She then became a homemaker devoted to raising her sons and supporting her husband’s business interests while also participating in Women’s Rotary, the Spring Branch Texas School District, the Episcopal Church and volunteer work in area hospitals. She also loved hiking in the Colorado Mountains, fly fishing and golf. A celebration of her life will be held April 3, 2011 from 2-4 PM at the Scottsdale Ranch Community Center, 10585 N. 100th Street in Scottsdale, AZ.